Cleveland Indians pitcher Trevor Bauer has a reputation for being a rather eccentric guy. He collects drones. He is a devoted conspiracy theorist. There is even some debate as to whether or not he carved a message about George W. Bush’s involvement in the terrorist attacks of September 11, 2001 into a pitcher’s mound. That is the backdrop for a tweet sent by Michael Baumann of The Ringer over the weekend. 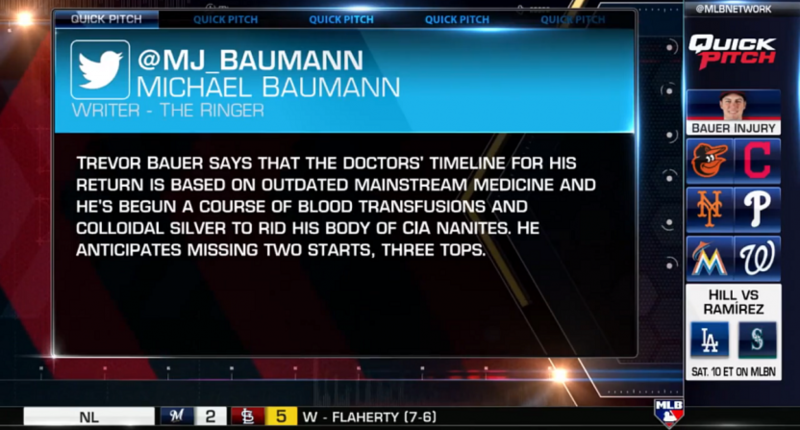 Trevor Bauer says that the doctors’ timeline for his return is based on outdated mainstream medicine and he’s begun a course of blood transfusions and colloidal silver to rid his body of CIA nanites. He anticipates missing two starts, three tops. Most people reading that can see that it is clearly a joke, but “most people” it seems does not include the staff at MLB Network, who ran with the report as if it were fact. MLB Network apparently wasn’t the only outlet to site the tweet as gospel. Bauer says he first saw the “news” on ESPN and was not pleased. He took to Twitter to say so. For his part, the tweet’s author, Bauermann, can’t believe anyone thought that it was anything more than a joke. It is certainly not a joke to Trevor Bauer, who is demanding on-air penance from both networks. How Far Will ESPN Go to Heal NFL Relationship?